I just saw the trailer for the new Dark Shadows movie. I don't think I will be in any great hurry to go see it. Please keep in mind that I remember watching the original series when I was about 10 years old or so. 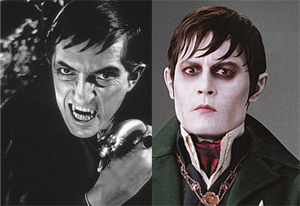 Now, I know that to most people, Johnny Depp can do no wrong, but he is definitely not a replacement for Jonathan Frid as Barnabas Collins. It may just be the missing black and white filming format, or that the censorship rules of the 60's left most everything to the imagination, making actors actually have to act. It might even just be that I detest it when people mess with a good thing. Remakes of old movie classics usually fall well short of the impact of the original. To a kid, the original Dark Shadows show was scary, not weird. Depp looks more like a strung out Willy Wonka than a 200 year old vampire. I can see that the movie might do well though. Most of it's audience have never seen the original show, so they aren't subject to the curse that being able to compare two different versions of a show can be. I am sure it will make someone a buck, or two, but for now, I think I'll pass.